The first attempt at surgical repair of a CDH was by Nauman in 1888; the 19-year-old patient presented with acute respiratory distress and an acute abdomen, and a laparotomy was performed. In 1889, O'Dwyer carried out the first repair of CDH in an infant. The first successful repair was in 1905. The patient was aged 9 years, and Heidenhain reduced the hernia and closed the diaphragmatic defect through a midline laparotomy incision. Approximately 20 years later, Hedbolm reported a 58% mortality for patients undergoing surgical intervention for CDH. As surgical expertise improved, innovative strategies were developed to address large diaphragmatic defects and agenesis of the hemidiaphragm. These techniques included the use of rotational muscle flaps, perirenal fascia, and synthetic patch repairs. The exponential elucidation of the pathophysiology of CDH was instrumental in improving the survival rate in infants. CDH was no longer considered a primarily surgical disease but, rather, a disease associated with pulmonary hypoplasia, pulmonary hypertension, pulmonary immaturity, and an increased susceptibility of the lungs to ventilation-induced lung injury. This led to a delayed approach to surgical repair and to a gentle but more ingenious respiratory support. For patient education resources, see the Digestive Disorders Center, as well as Hiatal Hernia. The diaphragm is a musculotendinous structure that separates the thoracic cavity from the abdominal cavity. It is composed of a central nonmuscular portion (central tendon) surrounded by a muscular rim in addition to the right and left diaphragmatic crura. The right and left diaphragmatic crura are two muscular bands that originate from vertebral bodies L1-L3 and L1-L2, respectively. These muscular bands insert into the dorsomedial diaphragm. Most diaphragmatic defects are posterolateral, with 85-90% of these occurring on the left. The label posterolateral may be a misnomer because it is frequently the case that much larger areas of the diaphragm are missing and only a posterior rim of muscle can be found. A hernial sac is present in 10-20% of cases. The Morgagni defect occurs posterior to the sternum and results from failure of sternal and costal fibers to fuse at the site where the superior epigastric artery crosses the diaphragm. The Morgagni defect is rare and is rarely a cause for surgery in the newborn. The diaphragm is derived from four embryonic structures: the septum transversum, the pleuroperitoneal membranes, mesoderm of the body wall, and esophageal mesenchyme. After the folding of the fetal head at 4-5 weeks' gestation, the septum transversum comes to lie as a semicircular shelf, which separates the heart from the liver. The septum transversum does not completely separate the thoracic cavity from the peritoneal cavity but allows pericardioperitoneal canals to exist on either side of the esophagus. During the fifth week of gestation, the pleuroperitoneal membranes develop along a line connecting the root of the 12th rib with the tips of the seventh to 12th ribs. The pleuroperitoneal membranes grow ventrally to fuse with the posterior margins of the septum transversum and the dorsal mesentery of the esophagus. Hence, at 6-7 weeks' gestation, the pleuroperitoneal canals are closed; the left closes after the right. The mesentery of the esophagus condenses to form the left and right crura of the diaphragm, and the mesoderm of the body wall forms the outer rim of diaphragmatic muscle. The posterolateral diaphragmatic defect is postulated to result from failure of closure of the pleuroperitoneal canals. The canal remains open when the intestines return to the abdomen at 10 weeks' gestation. Some intestine and other viscera enter the thorax and lead to compression of the developing lung at the crucial pseudoglandular stage and shifting of the mediastinum to the contralateral side. This causes compression of the heart and the contralateral lung as well. In 1984, Iritani proposed a different concept of diaphragmatic development. He suggested that a posthepatic mesenchymal plate develops between the septum transversum and the pericardioperitoneal canals. Lateral growth of this plate leads to closure of the pericardioperitoneal canals, and congenital diaphragmatic hernia results from a disturbance in growth of the posthepatic mesenchymal plate. The pathophysiology of CDH involves pulmonary hypoplasia, pulmonary hypertension, pulmonary immaturity, and potential deficiencies in the surfactant and antioxidant enzyme system. Because of bowel herniation into the chest during crucial stages of lung development, airway divisions are limited to the 12th to 14th generation on the ipsilateral side and to the 16th to 18th generation on the contralateral side. Normal airway development results in 23-35 divisions. Because airspace development follows airway development, alveolarization is similarly reduced. Pulmonary hypertension resulting from these arterial anomalies leads to right-to-left shunting at atrial and ductal levels. This persistent fetal circulation leads to right-side heart strain or failure and to the vicious circle of progressive hypoxemia, hypercarbia, acidosis, and pulmonary hypertension observed in the neonatal period. Infants with CDH also have impairment of the pulmonary antioxidant enzyme system and are more susceptible to hyperoxia-induced injury. In addition, a left ventricular smallness and hypoplasia are observed with CDH. This is believed to arise from decreased in-utero blood flow to the left ventricle, the mechanical compression of the herniated viscus similar to that observed in the lungs, and/or a primary yet unidentified developmental defect that simultaneously causes the diaphragmatic hernia and the lung problems. The initiating factor responsible for the development of CDH is unknown. Wide variations have been noted in the reported prevalence of chromosomal abnormalities (7-31%) in patients with CDH. The prevalence is higher in cases of CDH associated with other defects. Familial occurrence has been noted in fewer than 2% of cases. The role of drugs and environmental chemicals in the development of CDH is uncertain, but nitrofen, quinine, thalidomide, phenmetrazine, and polybrominated diphenyls have been used to induce CDH in various species. Investigations are exploring the link between CDH and defects in the retinoid signaling pathway in experimental models. Graph illustrating the concept of the hidden mortality of congenital diaphragmatic hernia. Image courtesy of Michael Harrison, MD. Long-term pulmonary disease depends on the degree of pulmonary hypoplasia, barotrauma, and volutrauma sustained in the neonatal period. Bronchopulmonary dysplasia and restrictive and/or obstructive lung disease may be observed. Failure to thrive is often observed in the presence of optimal feeding regimes. The use of extracorporeal membrane oxygenation (ECMO), hyperventilation treatment, and ototoxic medication places this population at a higher risk for sensorineural hearing loss, as well as for neurodevelopmental abnormalities (ie, cognitive and developmental delay, cerebral palsy, seizure disorders, impaired vision). Altered musculoskeletal development results in thoracic scoliosis, pectus deformities, and a decreased thoracic cavity on the affected side. Irish MS, Holm BA, Glick PL. Congenital diaphragmatic hernia. A historical review. Clin Perinatol. 1996 Dec. 23(4):625-53. [Medline]. Ladd WE, Gross RE. Congenital diaphragmatic hernia. N Engl J Med. 1940. 223:917-25. Koop CE, Johnson J. Transthoracic repair of diaphragmatic hernia in infants. Ann Surg. 1952 Dec. 136(6):1007-11. [Medline]. Iritani I. Experimental study on embryogenesis of congenital diaphragmatic hernia. Anat Embryol (Berl). 1984. 169(2):133-9. [Medline]. Koivusalo AI, Pakarinen MP, Lindahl HG, Rintala RJ. The cumulative incidence of significant gastroesophageal reflux in patients with congenital diaphragmatic hernia-a systematic clinical, pH-metric, and endoscopic follow-up study. J Pediatr Surg. 2008 Feb. 43(2):279-82. [Medline]. Glick PL, Pohlson EC, Resta R, et al. Maternal serum alpha-fetoprotein is a marker for fetal anomalies in pediatric surgery. J Pediatr Surg. 1988 Jan. 23(1 Pt 2):16-20. [Medline]. Janssen DJ, Tibboel D, Carnielli VP, et al. Surfactant phosphatidylcholine pool size in human neonates with congenital diaphragmatic hernia requiring ECMO. J Pediatr. 2003 Mar. 142(3):247-52. [Medline]. Lotze A, Knight GR, Anderson KD, et al. Surfactant (beractant) therapy for infants with congenital diaphragmatic hernia on ECMO: evidence of persistent surfactant deficiency. J Pediatr Surg. 1994 Mar. 29(3):407-12. [Medline]. Torfs CP, Curry CJ, Bateson TF, Honore LH. A population-based study of congenital diaphragmatic hernia. Teratology. 1992 Dec. 46(6):555-65. [Medline]. Shanmugam H, Brunelli L, Botto LD, Krikov S, Feldkamp ML. Epidemiology and Prognosis of Congenital Diaphragmatic Hernia: A Population-Based Cohort Study in Utah. Birth Defects Res. 2017 Sep 19. [Medline]. Clark RH, Hardin WD Jr, Hirschl RB, et al. Current surgical management of congenital diaphragmatic hernia: a report from the Congenital Diaphragmatic Hernia Study Group. J Pediatr Surg. 1998 Jul. 33(7):1004-9. [Medline]. Downard CD, Jaksic T, Garza JJ, Dzakovic A, Nemes L, Jennings RW, et al. Analysis of an improved survival rate for congenital diaphragmatic hernia. J Pediatr Surg. 2003 May. 38 (5):729-32. [Medline]. Dariel A, Rozé JC, Piloquet H, Podevin G, French CDH Study Group. Impact of prophylactic fundoplication on survival without growth disorder in left congenital diaphragmatic hernia requiring a patch repair. J Pediatr. 2010 Oct. 157 (4):688-90, 690.e1. [Medline]. Kawahara H, Okuyama H, Nose K, Nakai H, Yoneda A, Kubota A. Physiological and clinical characteristics of gastroesophageal reflux after congenital diaphragmatic hernia repair. J Pediatr Surg. 2010 Dec. 45(12):2346-50. [Medline]. Frisk V, Jakobson LS, Unger S, Trachsel D, O'Brien K. Long-term neurodevelopmental outcomes of congenital diaphragmatic hernia survivors not treated with extracorporeal membrane oxygenation. J Pediatr Surg. 2011 Jul. 46 (7):1309-18. [Medline]. Tonks A, Wyldes M, Somerset DA, Dent K, Abhyankar A, Bagchi I, et al. Congenital malformations of the diaphragm: findings of the West Midlands Congenital Anomaly Register 1995 to 2000. Prenat Diagn. 2004 Aug. 24 (8):596-604. [Medline]. Fauza DO, Wilson JM. Congenital diaphragmatic hernia and associated anomalies: their incidence, identification, and impact on prognosis. J Pediatr Surg. 1994 Aug. 29(8):1113-7. [Medline]. Tanaka T, Inamura N, Ishii R, Kayatani F, Yoneda A, Tazuke Y, et al. The evaluation of diastolic function using the diastolic wall strain (DWS) before and after radical surgery for congenital diaphragmatic hernia. Pediatr Surg Int. 2015 Oct. 31 (10):905-10. [Medline]. Britto IS, Sananes N, Olutoye OO, Cass DL, Sangi-Haghpeykar H, Lee TC, et al. Standardization of Sonographic Lung-to-Head Ratio Measurements in Isolated Congenital Diaphragmatic Hernia: Impact on the Reproducibility and Efficacy to Predict Outcomes. J Ultrasound Med. 2015 Oct. 34 (10):1721-7. [Medline]. Usui N, Kitano Y, Okuyama H, Saito M, Morikawa N, Takayasu H. Reliability of the lung to thorax transverse area ratio as a predictive parameter in fetuses with congenital diaphragmatic hernia. Pediatr Surg Int. 2011 Jan. 27(1):39-45. [Medline]. Kido S, Hidaka N, Sato Y, Fujita Y, Miyoshi K, Nagata K, et al. 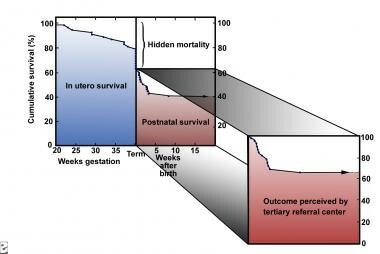 Re-evaluation of lung to thorax transverse area ratio immediately before birth in predicting postnatal short-term outcomes of fetuses with isolated left-sided congenital diaphragmatic hernia: A single center analysis. Congenit Anom (Kyoto). 2017 Aug 10. [Medline]. Bagolan P, Casaccia G, Crescenzi F, Nahom A, Trucchi A, Giorlandino C. Impact of a current treatment protocol on outcome of high-risk congenital diaphragmatic hernia. J Pediatr Surg. 2004 Mar. 39(3):313-8; discussion 313-8. [Medline]. Chess PR. The effects of gentle ventilation on survival in congenital diaphragmatic hernia. Pediatrics. 2004. 113:917. [Medline]. Reyes C, Chang LK, Waffarn F, Mir H, Warden MJ, Sills J. Delayed repair of congenital diaphragmatic hernia with early high-frequency oscillatory ventilation during preoperative stabilization. J Pediatr Surg. 1998 Jul. 33(7):1010-4; discussion 1014-6. [Medline]. Ng GY, Derry C, Marston L, Choudhury M, Holmes K, Calvert SA. Reduction in ventilator-induced lung injury improves outcome in congenital diaphragmatic hernia?. Pediatr Surg Int. 2008 Feb. 24(2):145-50. [Medline]. Bos AP, Tibboel D, Hazebroek FW, Molenaar JC, Lachmann B, Gommers D. Surfactant replacement therapy in high-risk congenital diaphragmatic hernia. Lancet. 1991 Nov 16. 338(8777):1279. [Medline]. Glick PL, Leach CL, Besner GE, et al. Pathophysiology of congenital diaphragmatic hernia. III: Exogenous surfactant therapy for the high-risk neonate with CDH. J Pediatr Surg. 1992 Jul. 27(7):866-9. [Medline]. Colby CE, Lally KP, Hintz SR, Lally PA, Tibboel D, Moya FR, et al. Surfactant replacement therapy on ECMO does not improve outcome in neonates with congenital diaphragmatic hernia. J Pediatr Surg. 2004 Nov. 39 (11):1632-7. [Medline]. Karamanoukian HL, O'Toole SJ, Glick PL. "State-of-the-art" management strategies for the fetus and neonate with congenital diaphragmatic hernia. J Perinatol. 1996 Mar-Apr. 16(2 Pt 2 Su):S40-7. [Medline]. Scaife ER, Johnson DG, Meyers RL, Johnson SM, Matlak ME. The split abdominal wall muscle flap--a simple, mesh-free approach to repair large diaphragmatic hernia. J Pediatr Surg. 2003 Dec. 38(12):1748-51. [Medline]. Okazaki T, Hasegawa S, Urushihara N, et al. Toldt's fascia flap: a new technique for repairing large diaphragmatic hernias. Pediatr Surg Int. 2005 Jan. 21(1):64-7. [Medline]. Masumoto K, Nagata K, Souzaki R, Uesugi T, Takahashi Y, Taguchi T. Effectiveness of diaphragmatic repair using an abdominal muscle flap in patients with recurrent congenital diaphragmatic hernia. J Pediatr Surg. 2007 Dec. 42(12):2007-11. [Medline]. Okazaki T, Okawada M, Ishii J, Koga H, Miyano G, Doi T, et al. Intraoperative ventilation during thoracoscopic repair of neonatal congenital diaphragmatic hernia. Pediatr Surg Int. 2017 Aug 12. [Medline]. Gander JW, Fisher JC, Gross ER, Reichstein AR, Cowles RA, Aspelund G. Early recurrence of congenital diaphragmatic hernia is higher after thoracoscopic than open repair: a single institutional study. J Pediatr Surg. 2011 Jul. 46(7):1303-8. [Medline]. Okazaki T, Nishimura K, Takahashi T, Shoji H, Shimizu T, Tanaka T. Indications for thoracoscopic repair of congenital diaphragmatic hernia in neonates. Pediatr Surg Int. 2011 Jan. 27(1):35-8. [Medline]. Terui K, Nagata K, Ito M, Yamoto M, Shiraishi M, Taguchi T, et al. Surgical approaches for neonatal congenital diaphragmatic hernia: a systematic review and meta-analysis. Pediatr Surg Int. 2015 Oct. 31 (10):891-7. [Medline]. Tyson AF, Sola R Jr, Arnold MR, Cosper GH, Schulman AM. Thoracoscopic Versus Open Congenital Diaphragmatic Hernia Repair: Single Tertiary Center Review. J Laparoendosc Adv Surg Tech A. 2017 Oct 4. [Medline]. Wilson JM, Bower LK, Lund DP. Evolution of the technique of congenital diaphragmatic hernia repair on ECMO. J Pediatr Surg. 1994 Aug. 29(8):1109-12. [Medline]. Seravalli V, Jelin EB, Miller JL, Tekes A, Vricella L, Baschat AA. Fetoscopic tracheal occlusion for treatment of non-isolated congenital diaphragmatic hernia. Prenat Diagn. 2017 Aug 11. [Medline]. Lally KP, Bagolan P, Hosie S, Lally PA, Stewart M, Cotten CM, et al. Corticosteroids for fetuses with congenital diaphragmatic hernia: can we show benefit?. J Pediatr Surg. 2006 Apr. 41 (4):668-74; discussion 668-74. [Medline]. Beurskens LW, Tibboel D, Lindemans J, Duvekot JJ, Cohen-Overbeek TE, Veenma DC. Retinol status of newborn infants is associated with congenital diaphragmatic hernia. Pediatrics. 2010 Oct. 126(4):712-20. [Medline]. Major D, Cadenas M, Fournier L, Leclerc S, Lefebvre M, Cloutier R. Retinol status of newborn infants with congenital diaphragmatic hernia. Pediatr Surg Int. 1998 Oct. 13(8):547-9. [Medline]. Lewis NA, Holm BA, Rossman J, Swartz D, Glick PL. Late administration of antenatal vitamin A promotes pulmonary structural maturation and improves ventilation in the lamb model of congenital diaphragmatic hernia. Pediatr Surg Int. 2011 Feb. 27(2):119-24. [Medline]. Lewis NA, Holm BA, Swartz D, Sokolowski J, Rossman J, Glick PL. Antenatal vitamin A decreases ventilation-induced lung injury in the lamb model of congenital diaphragmatic hernia. Asian J Surg. 2006 Jul. 29(3):193-7. [Medline]. Babiuk RP, Thébaud B, Greer JJ. Reductions in the incidence of nitrofen-induced diaphragmatic hernia by vitamin A and retinoic acid. Am J Physiol Lung Cell Mol Physiol. 2004 May. 286(5):L970-3. [Medline]. St Peter SD, Valusek PA, Tsao K, Holcomb GW 3rd, Ostlie DJ, Snyder CL. Abdominal complications related to type of repair for congenital diaphragmatic hernia. J Surg Res. 2007 Jun 15. 140 (2):234-6. [Medline]. Photograph of a one-day-old infant with congenital diaphragmatic hernia. Note the scaphoid abdomen. This occurs if significant visceral herniation into the chest is present. Radiograph of an infant with congenital diaphragmatic hernia. Note shift of the mediastinum to the right, air-filled bowel in the left chest, and the position of the orogastric tube. Newborn baby with congenital diaphragmatic hernia on venoarterial extracorporeal membrane oxygenation (ECMO). Note the arterial and venous cannulas connected to the bedside cardiovascular bypass machine. Diagram illustrating the sheep model of PLUG, the trachea used for the fetal management of congenital diaphragmatic hernia. Image courtesy of Michael Harrison, MD.